Delizz strawberry plants are here! Strawberry plants are constantly being developed and cross-bred in attempt to improve upon the already-great qualities inherent in the small fruits. When the breeding programs scattered across the globe stumble upon (or painstakingly isolate!) genetic traits that result in superior strawberries, strawberry lovers everywhere benefit. It just so happens that a new strawberry variety has been developed and released and will be headed to markets in the United States as early as this spring. ABZ Seeds, a Dutch company from Andijk-Holland specializing in gourmet strawberries, has developed a new strawberry cultivar called Delizz Strawberry. Delizz strawberries are being produced and sold through the Holland Strawberry House at present, but are headed this way amidst significant buzz, and should be available at some point this spring 2016 (be sure to check the seed and plant directories for availability). They were available in Europe, Asia, and Australia last year (2015). Delizz strawberry plants are true F1 hybrids (Fragaria x ananassa) which means that, unlike most strawberry seeds, Delizz strawberry seeds will grow true plants. Each F1 Delizz strawberry seed will grow a plant that is basically identical to every other seed-grown plant. Most of the popular hybrids like Chandler, Honeoye, Ozark Beauty, Earliglow, Allstar, and Jewel will not grow true from seed like the Delizz F1 hybrid will. Additionally, Delizz strawberries are day-neutral, which means they will produce a steady stream of strawberries throughout the growing season. So, from early summer until autumn rolls around, Delizz strawberry plants will produce steadily (for about three months or so). And, they will produce for almost a month even if kept indoors by a well-lighted window. The plants grow in a compact habit with a average height between 10 and 24 inches. The dark green upright foliage will attempt to hide the berries, but you’ll find them eventually. Each plant has a spread of only about 12 inches. The Delizz strawberries themselves are smaller than the typical June-bearing varieties. The mature berries will be orange-red in appearance and conical in shape. They average between 1 and 1.5 inches in size and weigh around 0.5-0.6 oz. Each plant can be expected to produce up to 45 small/medium, sweet, and aromatic Delizz strawberries under appropriate growing conditions. For best results, the strawberries should be harvested frequently, every 2 or 3 days. 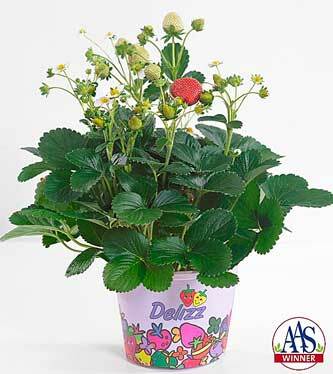 Delizz strawberry plants should be spaced about 20 inches apart if planting them in the garden. 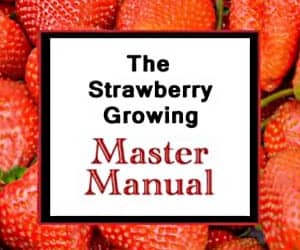 And, although strawberry plants are perennial in nature, Delizz strawberries should be grown as annuals per the breeders who developed the cultivar. If growing from seed, the plants will usually take between 4 and 7 days to germinate (at an approximate 90% germination rate) and 120 days to produce fruit. If planting transplants, they will generally set fruit in about 60 days. The need full sun in order to grow properly (see the Growing Strawberries reference page for much more general strawberry growing information). 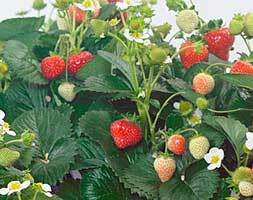 The cultivar-specific instructions for growing Delizz strawberry plants can be accessed here. Strawberry Delizz F1 plants and seeds are already making waves. The non-profit All-American Selections organization focuses on selecting, testing, and recommending specific cultivars that are superior to others for home garden use and greenhouse use. Strawberry Delizz F1 has been announced as the National Winner for 2016. So, check with your local nurseries to see if they will be carrying them, and buy Delizz strawberry plants or seeds this spring if you are ready for something new! I bought my plant from the garden centre in June there are fruits on it but not getting enough red fruits at one given time to do anything with them most at one time has been six. Right now it’s full of fruit but they are not going red. Also I find juvenile berries are going dead on the plant. What am I doing wrong. Also is it wise to take all the fruits off now even though they are green and try to ripen them on window ledge. I contacted the company and they said that the seeds will not grow true to type. The seeds from these berries would be and F2, unlike the original F1 seed. Where can I buy this variety for home gardening? I would recommend contacting Loghouse (link to their page above) and inquire about their stock and availability dates. Good luck! Thank you for the publicity for All-America Selections and its 2016 winner.